802.11ac is all the rage, and rightfully so. It represents another fundamental change in the innovation of the Wi-Fi 802.11 protocol that promises to boost wireless LAN speeds into the gigabit world. 802.11ac gets this big leap in Wi-Fi performance using wider channels, more efficient modulation (the way in which bits are carried within RF waves), and multiple user connections (so-called multi-user MIMO). And it will come in waves. Literally. However, Wave 2 requires new silicon chips that are different from Wave 1 devices, meaning a hardware upgrade will be required. Also, beware that not all 802.11sc access points will be created equal. Many using the Broadcom chip will suffer from some limitations, such as the inability to support more than 50 encrypted clients. And without an onboard CPU in the Broadcom chip, all Wi-Fi functions will have to be processed by the AP's host CPU. This is far less efficient because the offloading prevents the AP CPU from using low-power states. Wider channels are also compatible with 20MHz or 40MHz 802.11a and 11n devices. 802.11ac uses an enhanced version of protection mechanisms (RTS/CTS) to dynamically determine whether all or only some (such as the primary 20MHz, 40MHz or 80MHz) of the wider channel is available for transmission. Finally, a fundamental priority for the IEEE is to maintain backward compatibility with previous 802.11 protocols. As a 5GHz-only technology, 802.11ac supports both 802.11a and 11n frame formats and protection mechanisms and is fully backward compatible with both. So we're all good, right? Not so fast. What vendors won't tell you about 802.11ac is that spectral efficiency can easily be reduced in a Wi-Fi network whenever multiple APs are using wider channels. Spectral efficiency relates to the information rate that can be transmitted over a given bandwidth in a specific communication system. It is a measure of how efficiently a limited spectrum is utilized by the physical layer protocol. And many vendors won't tell you that the modulation techniques that allow faster communications will only benefit clients at close range with a very high signal-to-noise ratio (that the preponderance of enterprise access points can't deliver). Range will also be an issue as 5GHz Wi-Fi signals have shorter useful range and do not penetrate obstructions as well as 2.4GHz signals. As a result, it's important to look for 802.11ac products that focus RF signals, increasing gain and extending reach to enable higher data and modulation rates. The ability for Wi-Fi systems to adapt to changing environmental conditions and a myriad of different client types significantly increases the likelihood that all these capabilities (that make 802.11ac so attractive to enterprises) can actually be put to good use. 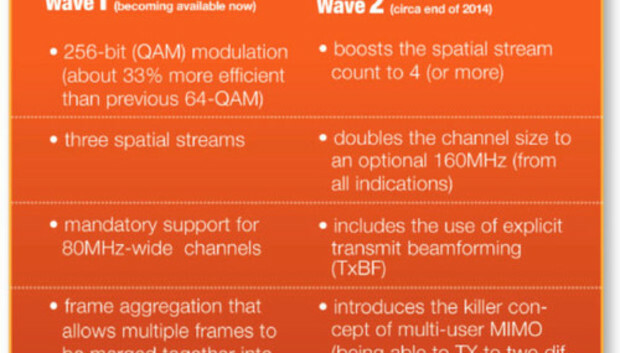 Finally, keep in mind that 802.11ac will come at a cost -- a higher cost. This cost is not only for the access points but also for new Power over Ethernet switches that will have to support the higher-power 802.3at standard that many of these new 802.11ac APs will require. For 802.11ac to work as advertised, it's essential to have greater control over the signal paths within the RF spectrum. This proved to be the case as the industry moved from 802.11g to 802.11n, which introduced multiple Wi-Fi radio chains (MIMO), a whole bunch of new PHY rates, spatial multiplexing and the aggregation of frames. The same is true as companies migrate from 802.11n to 802.11ac. Also with the possibility of 20MHz, 40 MHz, 80MHz or 160MHz channel widths, it becomes increasingly difficult to determine what channel widths are optimal for each environment based on spectral reuse, the number of APs, transmit power, client device types and channel support, etc. Finally, when multi-user MIMO comes around, it will be imperative to have access points that can direct Wi-Fi signals to each client to better separate signals. This enables higher sustained data rates, and increased client capacities can be achieved because users can get on and off the Wi-Fi network faster and with less packet loss and retransmissions. Adaptive or smart antennas will simply add unmatched value to any 802.11ac deployment. Without explicit RF controls, 802.11ac performance will be severely limited. Because adaptive antennas constantly focus Wi-Fi signals over the fastest possible path at any given time, this provides better spectral efficiency -- enabling larger frames to be transmitted, advanced modulation techniques to be extended and higher SNR/SINR levels to be achieved. 802.11ac is an optimistic protocol with impressive theoretical gains. But at the end of the day, the best approach to improve capacity and enable such high data rates with 802.11ac will require a more sophisticated approach to RF management. Without it, you just might be wasting your time and money.